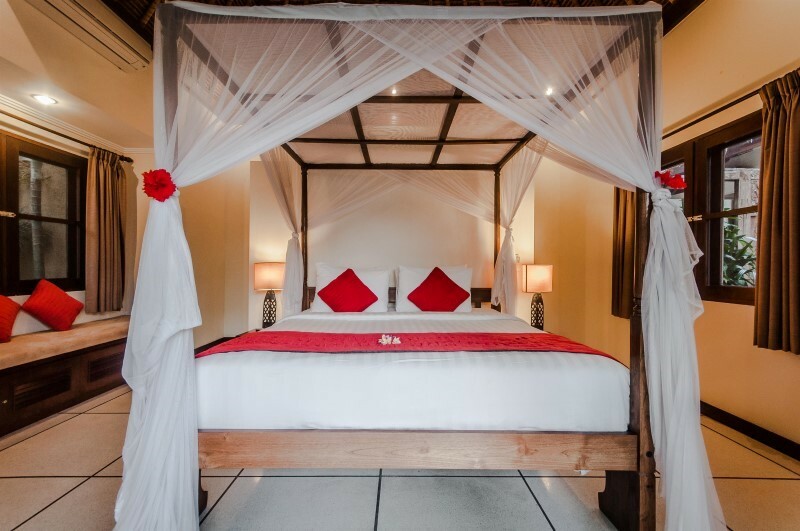 We had an amazing experience at the Gembira Villa. The staff was welcoming and helpful. They were always more than willing at assist with our needs. This villa is just as it appears in the photo. I felt it was more beautiful than the photos capture. There’s a great grocery less than 10 mins away. A shopping strip is in walking distance, along with restaurants and clubs. 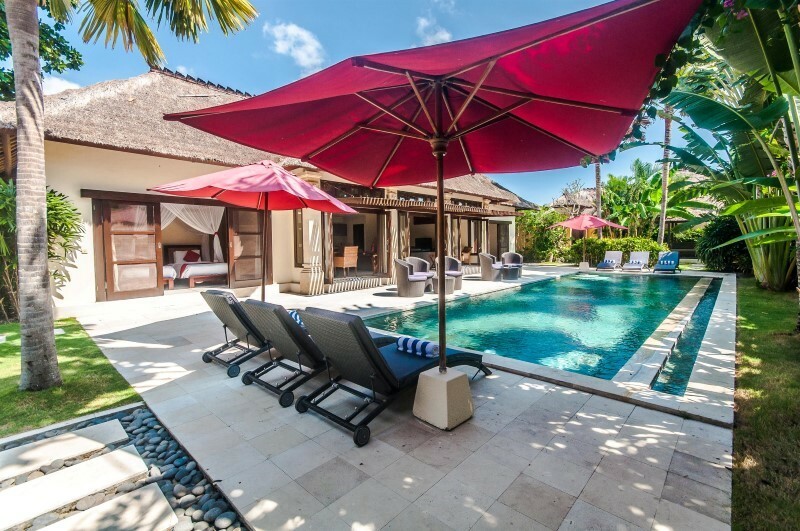 I plan to return to this villa and would suggest it to all that want a luxury, private villa in Bali. 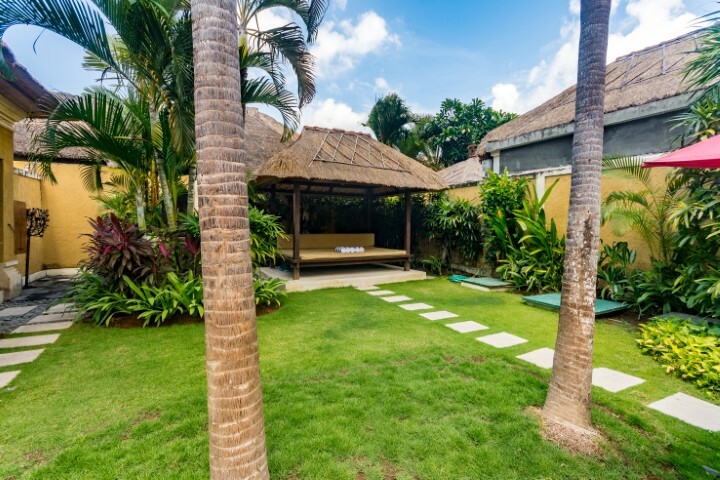 The private villa is located a comfortable walking distance between Bintang Supermarket and the beach. 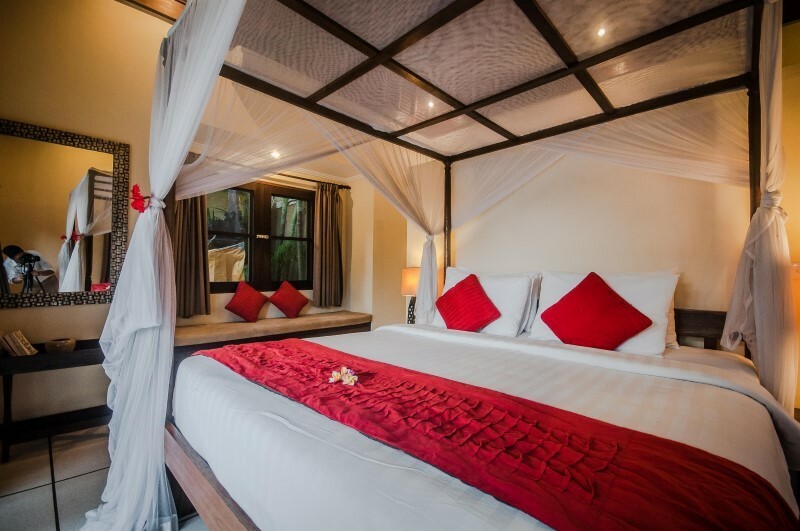 It’s amenities include private pool, air conditioning, cooked breakfast, serviced rooms and security guards all situated in lush tropical gardens. The staff are extremely pleasant and helpful and any concerns or needs are immediately attended to. Another great week at a Bugis villa. This time at Villa Gembira. Not as good as Villa Jaclan, but still a great stay. Kadek and the staff went out of their way to make us comfortable. We’ll be back again next year. 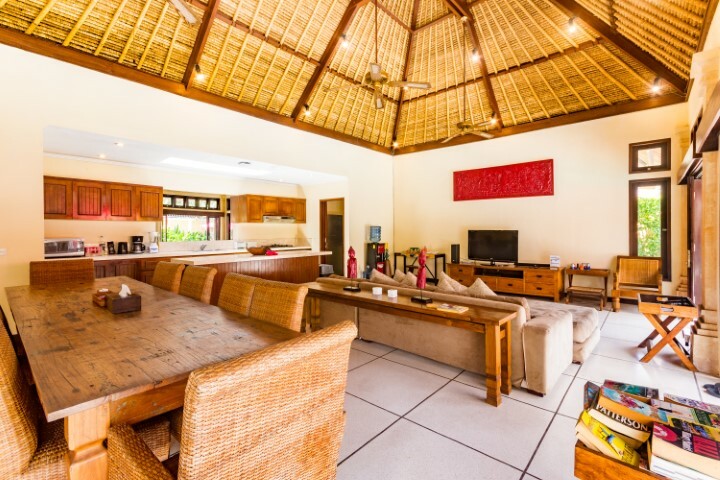 Very spacious and comfortable villa, our family of six. Once holiday ambience, obliging staff who looked after all our needs including transport for excursions. Good position for accessibility to sights and surrounds. 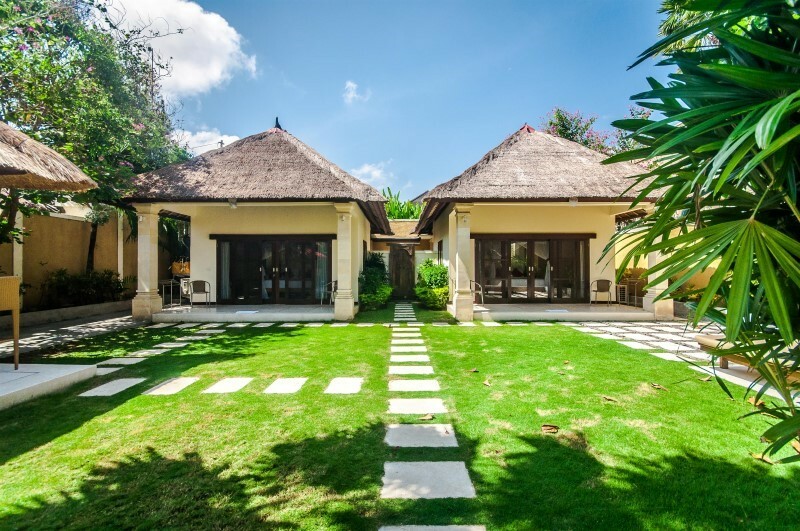 Entering Villa Gembira, a perfect Seminyak family villa, instantly exposes you to the beauty of tropical living on the extraordinary paradise island of Bali. 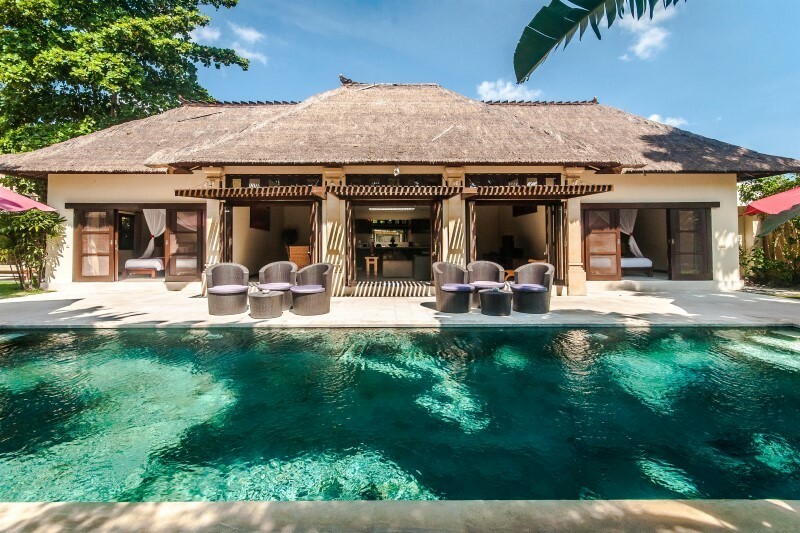 Villa Gembira is a Balinese themed private villa with a contemporary twist that displays the craftsmanship of local artisans in the form of ceremonial ornaments and decorations. Soft furnishings are highlighted by checkered cloth that is so dominant in Balinese Hinduism and symbolizes the spiritual lifestyle in Bali. Terrazzo and the aromatic thatch of the roof structure impart glimpses of traditional village living. 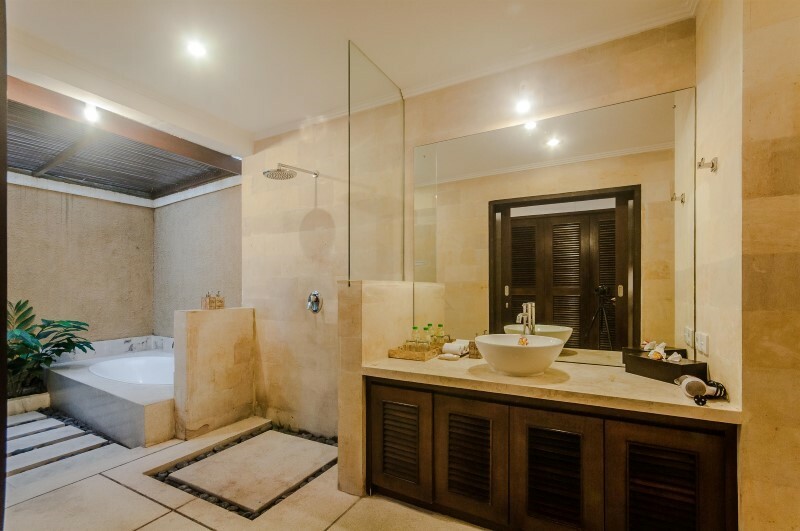 This villa is single-story luxury villa featuring four bedrooms with en-suite and semi outdoor bathrooms. The fully equipped kitchen and a spacious living area are perfect for entertaining. 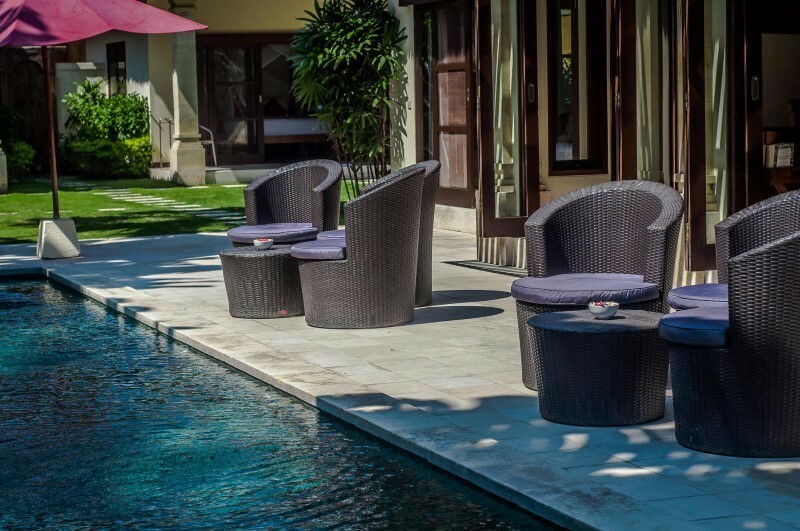 Step outside, and you will appreciate the thoughtfully designed terrace, with its outdoor BBQ bar, comfortable lounge chairs and sparkling pool. 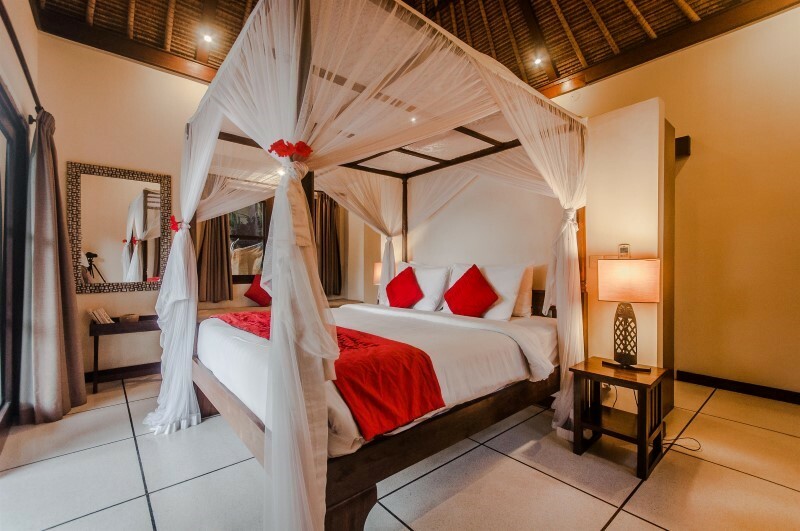 If relaxation is on your vacation agenda, Villa Gembira offers a perfectly stylish setting for a carefree retreat. 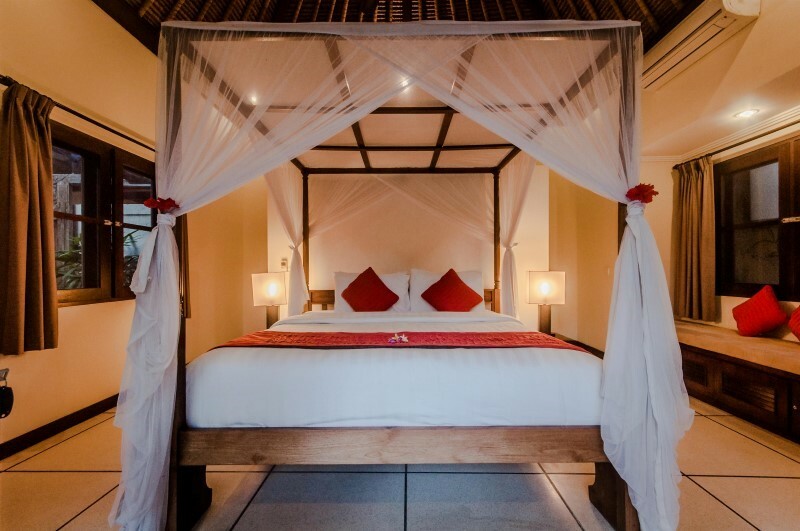 Just a few steps away from the shopping, dining, spas and the beach, Villa Gembira offers a sanctuary where the element of nature penetrates the heart and soul. 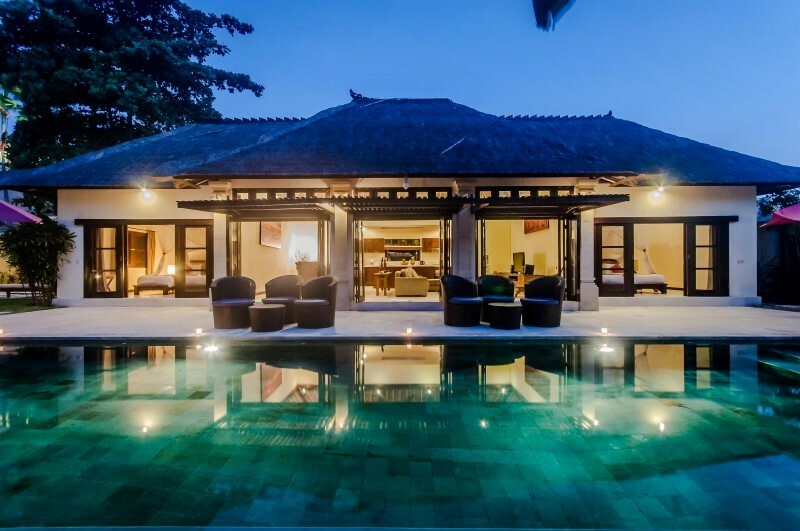 Overlooking the swimming pool and beautiful tropical landscape is the main pavilion, which houses the kitchen, living space and dining area. 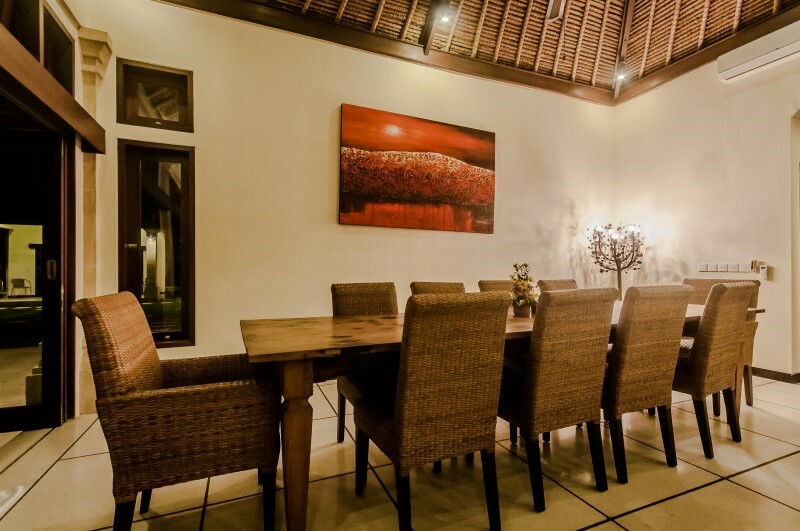 The dining facilities consist of a luxurious dining table and chair. The living area is very suitable for relaxation for families or groups of friends. 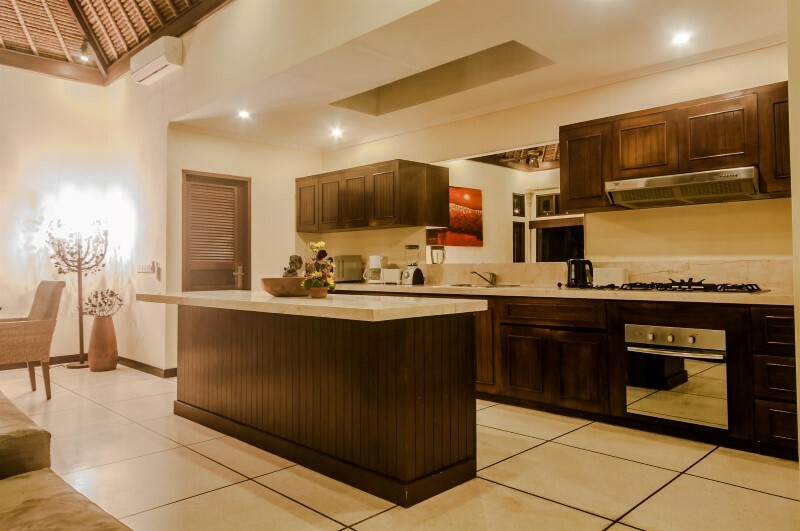 Kitchen facilities located in the corner of the space are complete with a gas stove, microwave, coffee maker, juicer, water dispenser, refrigerator, chinaware and glassware. 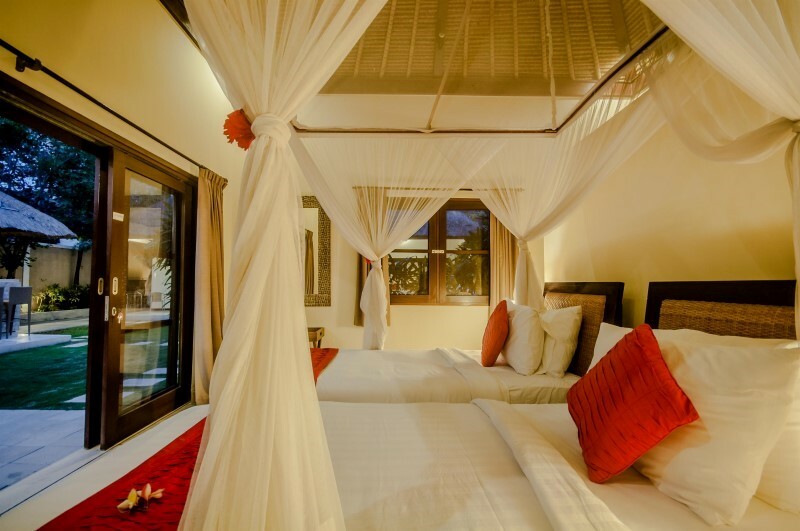 There are two bedrooms either side of the main building, and two more guesthouses in the beautiful garden. 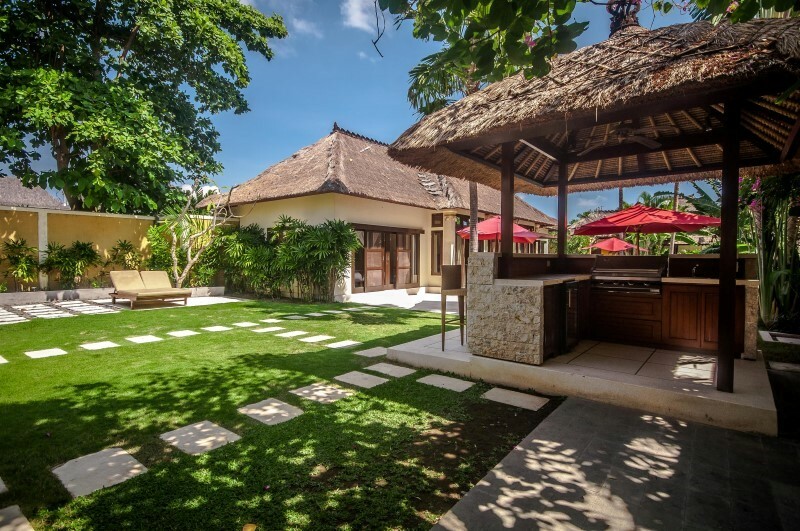 The palimanan stone steps leading to the guesthouses and tropical garden accentuate the beauty of the villa. The guesthouses are also overlooking the swimming pool and barbeque bar. 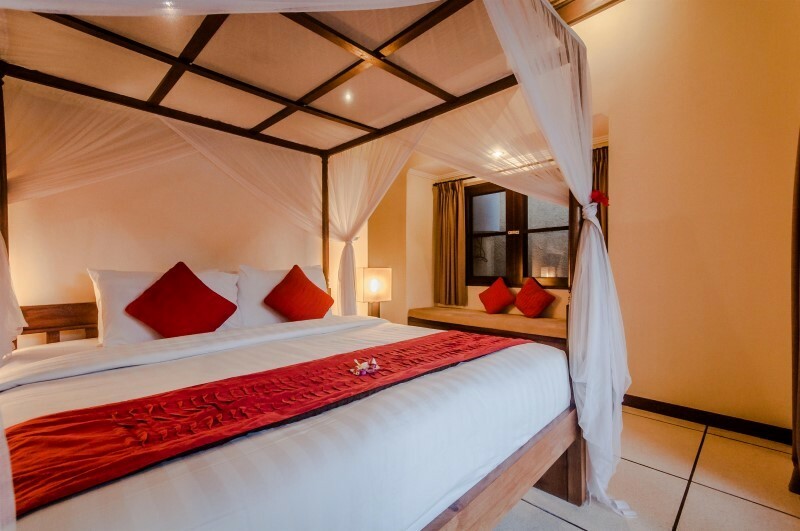 The two bedrooms attached to the main building have king sized beds, and the two guest houses are also king sized beds, that can be converted into two single beds if required. 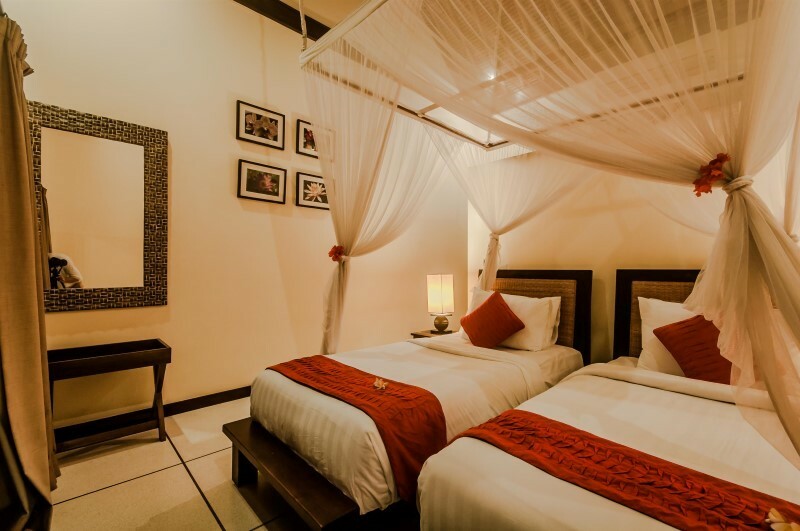 All bedrooms feature wardrobes with safe deposit box, and are air conditioned with ceiling fans. 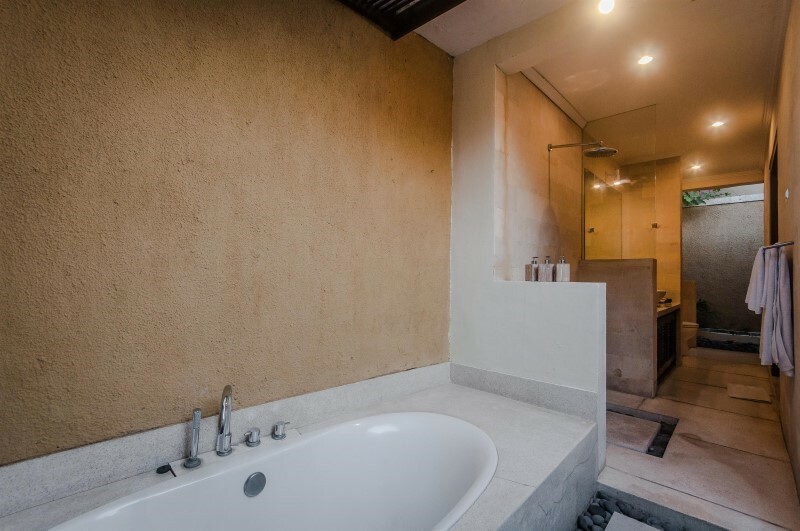 The guesthouse bathrooms feature bathtubs and all bathrooms have open showers with hot and cold running water and exclusive guest amenities and supplies. A large infinity swimming pool dominates the grounds of the villa. It is surrounded by a tropical garden, green grass, palm trees and other classically tropical vegetation. Just facing the entrance gate, a Buddha statue welcomes you. 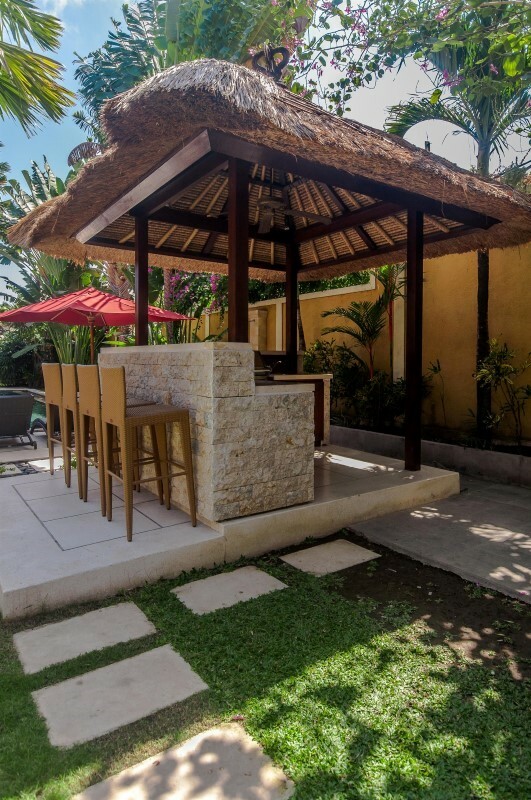 Behind the statue, a gazebo with a daybed is prepared for you to make your holiday unforgettable. Stayed for five days with family. 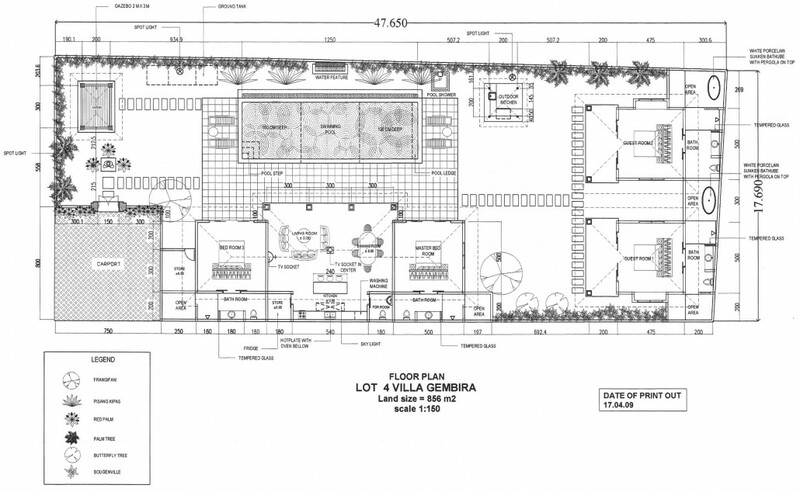 Gembira is a lovely villa, well spaced out and semi shaded pool. 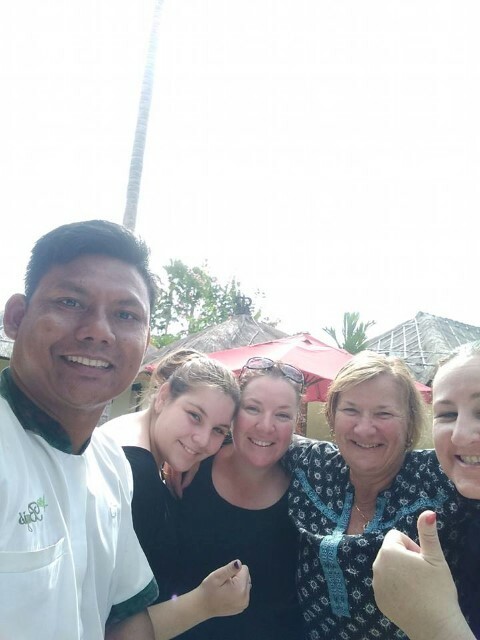 The staff are excellent, attending to every need, lovely Indonesia breakfast, bed and bathrooms very comfy. Easy to order in or walk to Bintang for supplies or cab. Stayed at Santi this time last year. 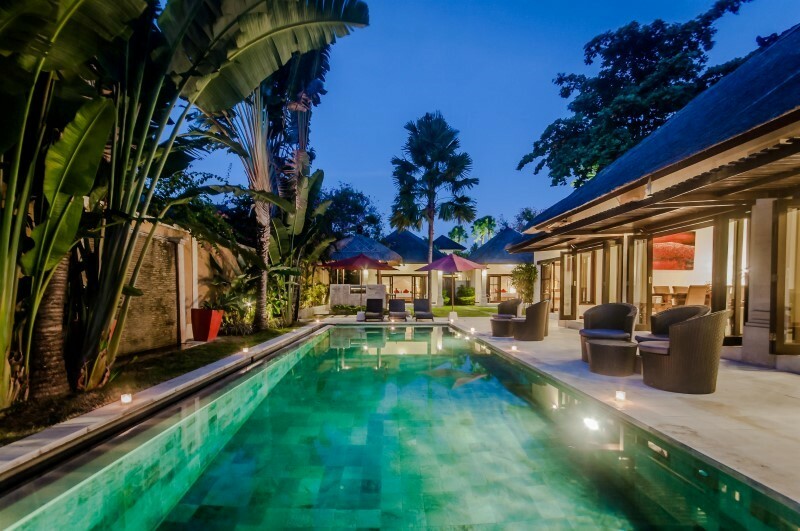 Would highly recommend Villa Bugis to organise your villa for next vacation. Thank you! 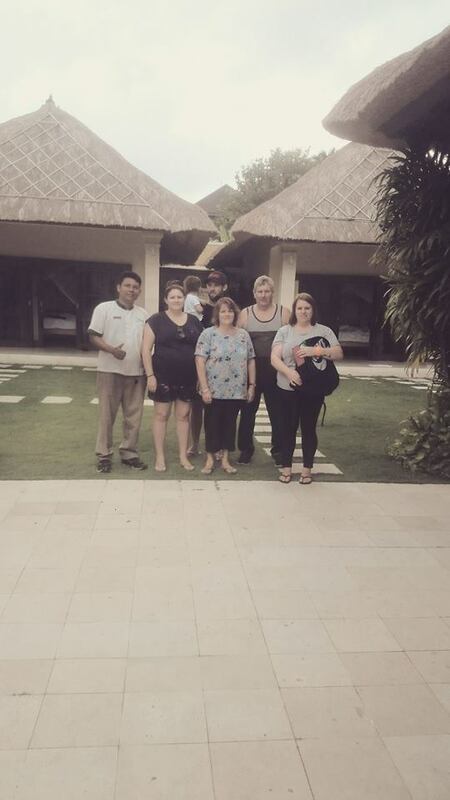 9 Family members all stayed at Villa Gembira, part of the Villa Bugis group. What a brilliant find. We had 3 couples, 2 singles and 1 child. 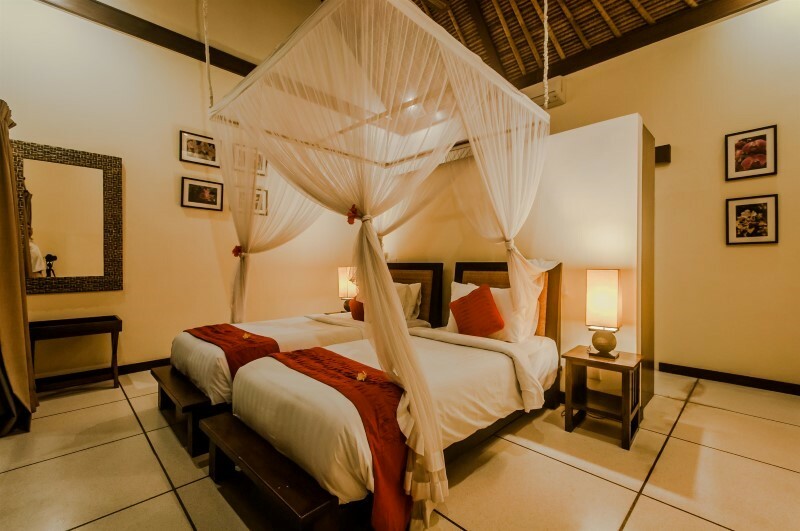 All the couples had their own Villas with an extra bed for the child in one of the villas and the 2 singles shared a villa. Cooked breakfast was included and we organised a cooked Balinese BBQ one evening which was excellent. The large pool and day bed were well used and the communal eating and lounge area was very comfortable. 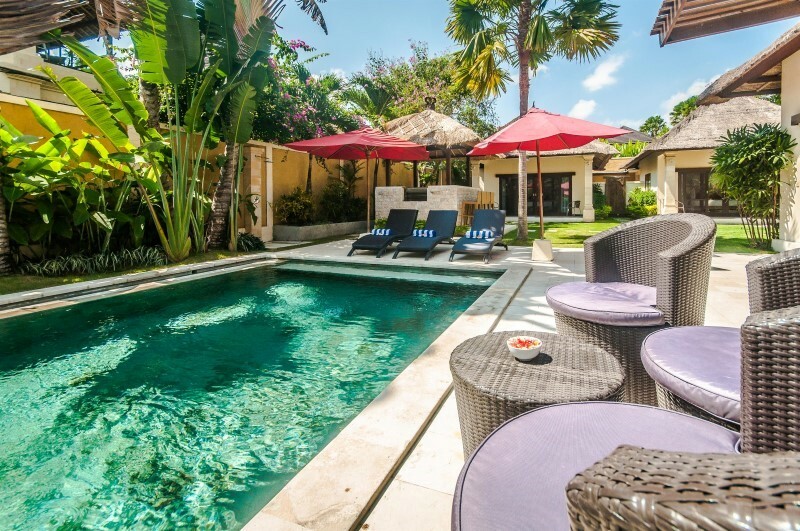 Close proximity to Seminyak shopping and walking distance to the beach. Highly recommended. The service was exceptional. Thank you for a very memorable family holiday. 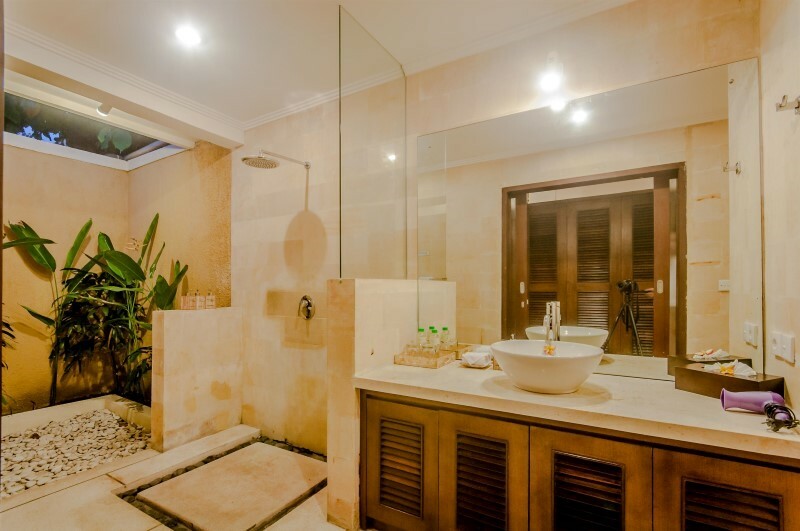 Fantastic stay in villa gembira (one of the vilas under the villa bugis management). We are a family of five, including young children and were staying here with another family. The staff are some of the friendliest, most helpful and competent I have met. The villa itself was perfect for us. A ten minute walk to the shops (including supermarket if you are self catering) and about ten minutes to the beach. I recommend you get them to cook for you. Awesome barbecues cooked at your place while you sip a G&T ! 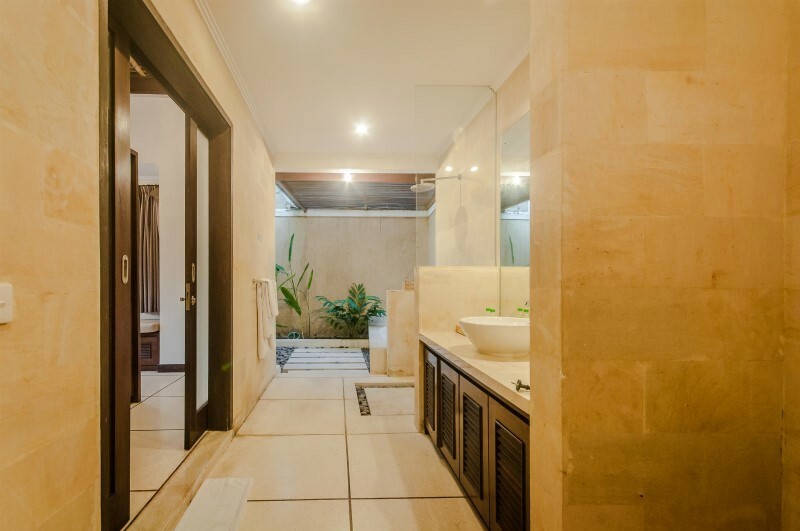 This is a 4 Bed Room Villa among the various options available with Villa Bugis Team. We stayed there for 5 Nights. 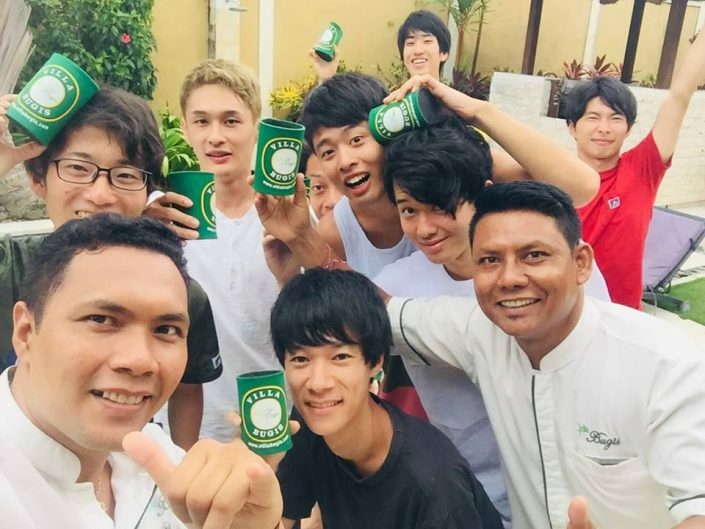 The Team of Villa Bugis is absolutely professional and well organized. They attempt to cater to all your needs as much possible. The Pool is very good and the Accommodations is good as well. The Location is a bit away from the Main Street. For Multiple Commute, you would have to Rent a Bike. If in a Group, you should rent a Car. The Main Street is very active in day and night. It is full of eateries and night life options. The Beach attached to this area is very nice as well. 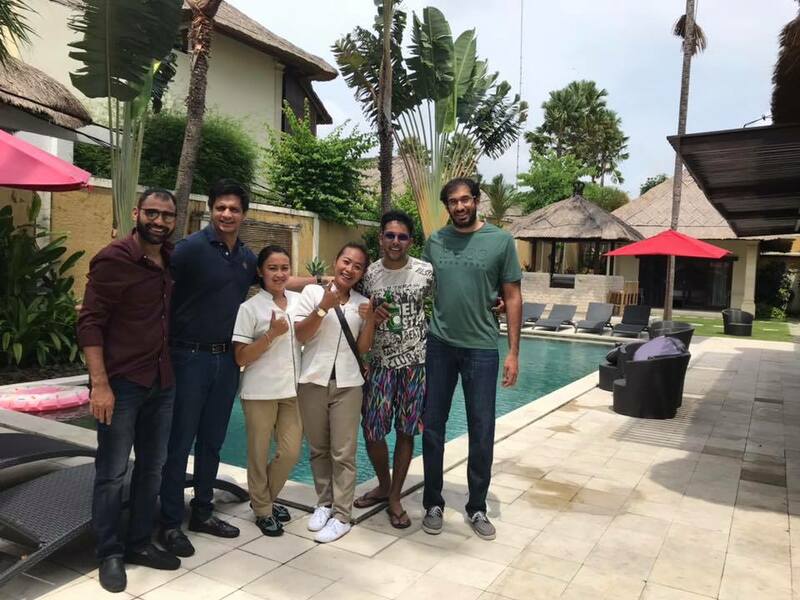 We had a great time and I am sure that everyone who opt for this villa would do too. My family and myself had the most amazing trip to Bali in Feb this year. 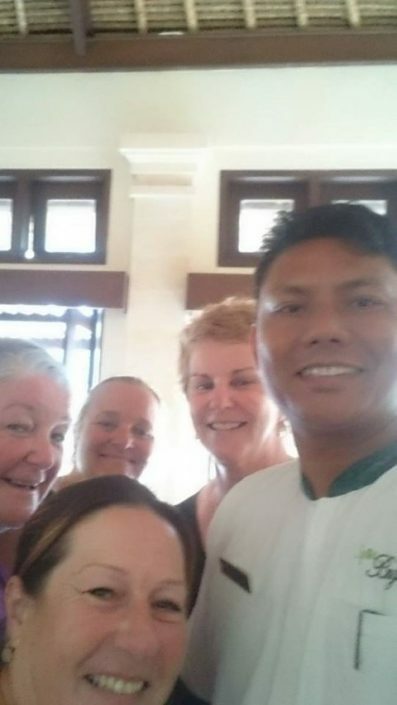 The villa staff are just beautiful and extreamly helpful. Our villa was clean, tidy and really comfortable. 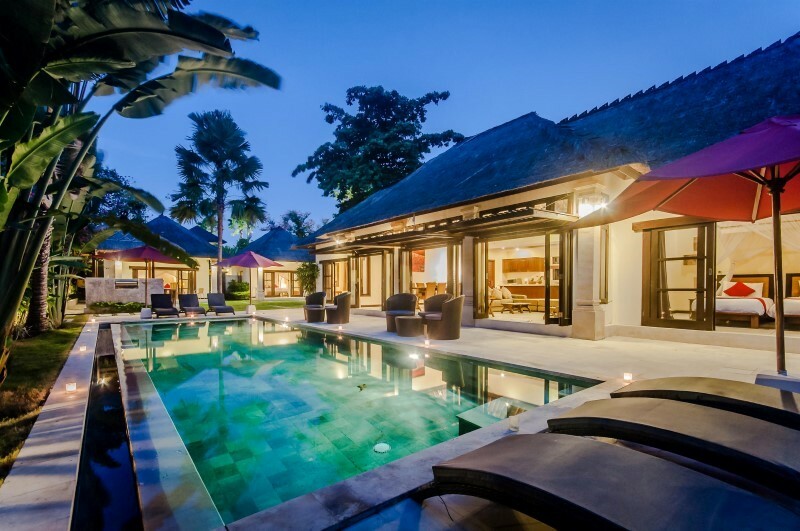 This Villa is a must!! We just loved the pool!! We have already booked our next trip back at Ye end of the year and we will be staying with villa Bugis!! 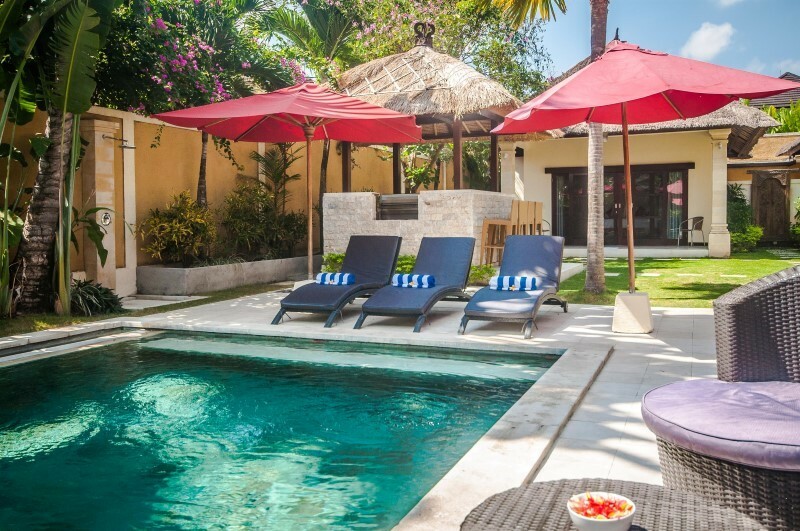 We absolutely loved our recent stay at Villa Gembira, being our 5th time we’ve booked through Villa Bugis we knew what to expect from them & they didn’t disappoint again! 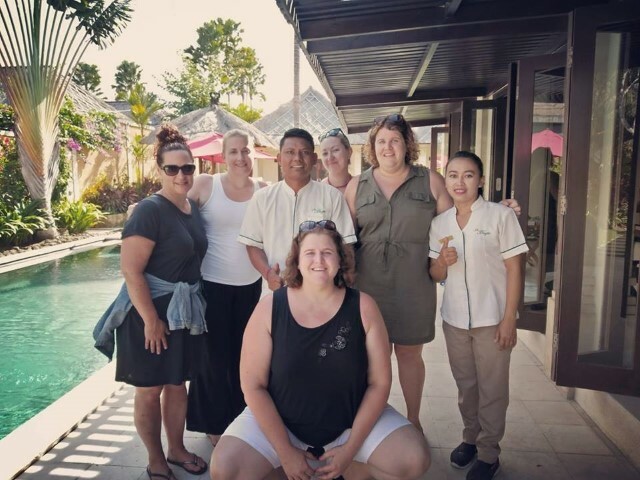 From the moment we arrived Gde, Nyoman, Sri & all the other wonderful staff made us feel right at home! Nothing is ever too much trouble & they always have smiles on their faces! Looking forward to going back next April for my nieces wedding highly recommend! 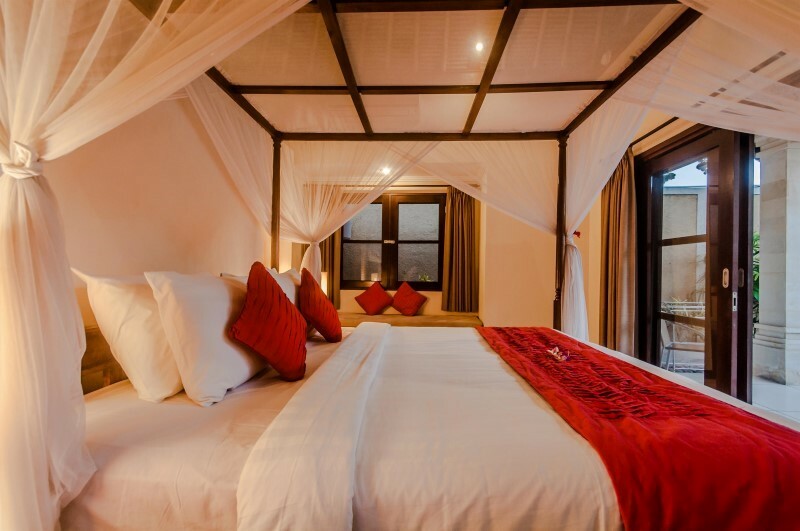 We all loved Villa Gembira! From the minute we walked through the doors, to the beautiful HUGE pool, the fabulous comfy accommodation and the very attentive staff! Nothing was too much trouble! We had our coffees delivered to us every morning and a beautiful choice for breakfast. We had a bbq cooked for us at the villa and it was amazing! Beautiful and large grounds lots of places to sit and relax, and all kept up to a very high standard. Nice hot showers, no electricity problems (even though there was outside the villa). Staff were fantastic! All in all a great holiday, everything we needed was at the villa. Such a pleasure to come back to after being out most days. We shall be back! Thank you. 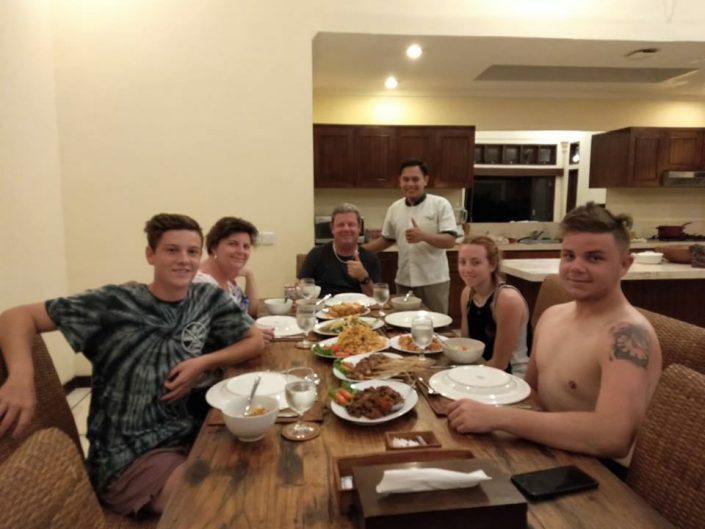 We had stayed at Villa Cinta for a week and were so impressed with the villa and staff that we decided (after a brief stay at Gili Island) to return to Villa Bugis is we could secure a booking at short notice. They very kindly upgraded us to Villa Gembira and we couldn’t have been happier. 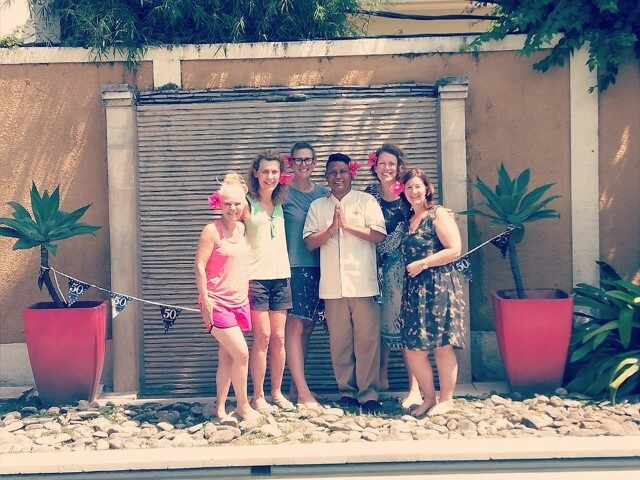 The villa was beautiful, but the staff were the absolute joy of our stay. Ever helpful and never too busy to assist us with anything. 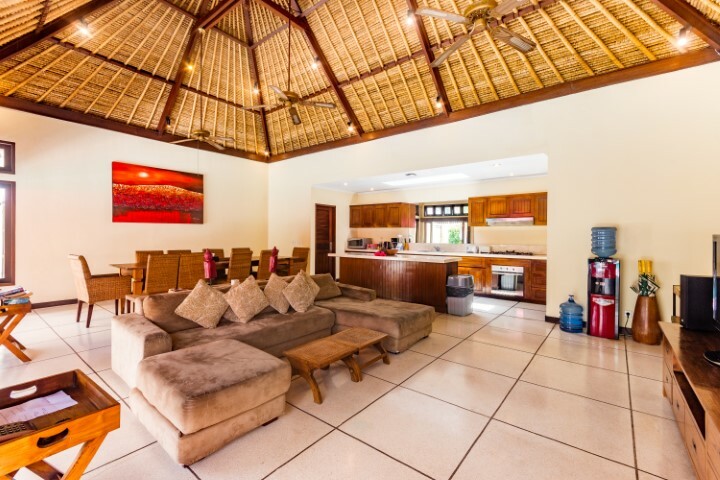 The villa was close to restaurants, shopping, beaches and other entertainment. 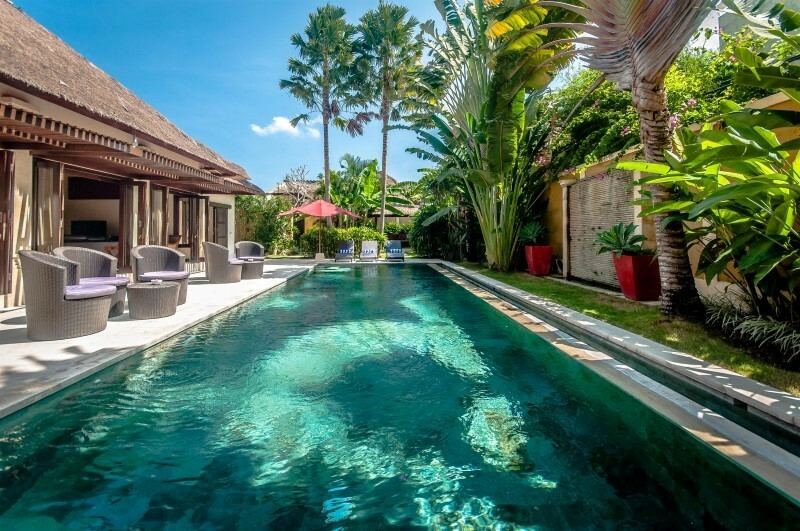 We intend to book for Bali again next year and wouldn’t consider looking for anything but a villa in the Villa Bugis chain. Absolutely recommend highly. 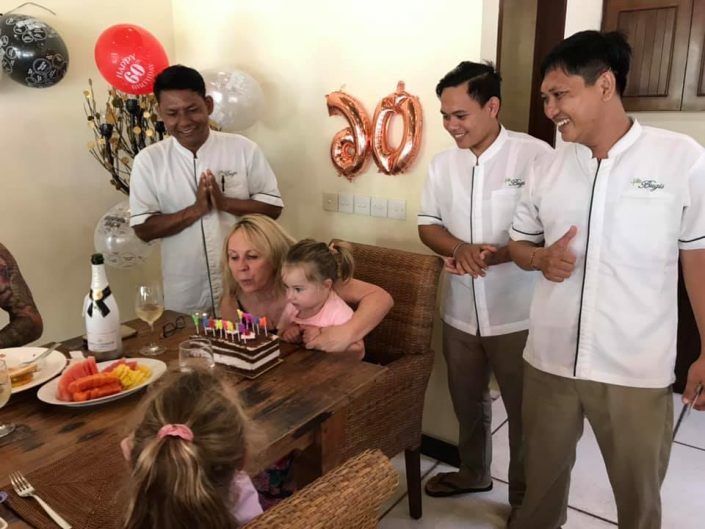 We recently stayed in Villa Gembira & Villa Olive for combined birthday celebrations, and had a wonderful time! 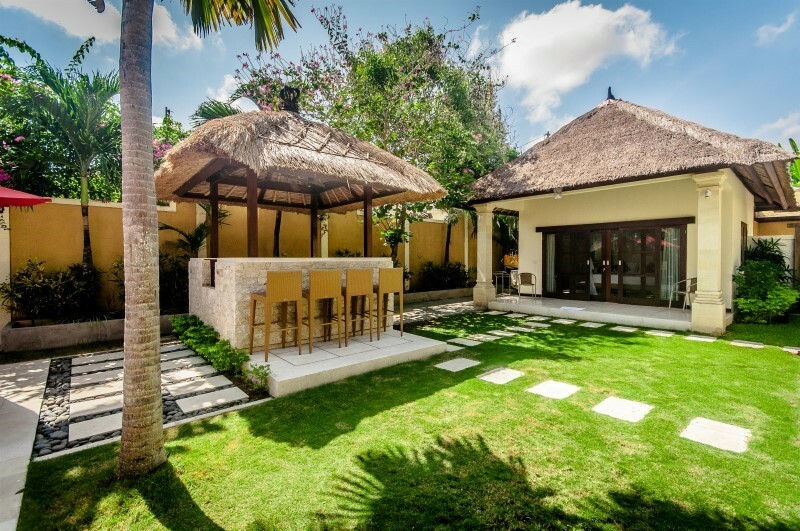 The villas are located in a great part of Seminyak, close to many restaurants and shops. The rooms were all lovely, beautiful layout and very clean, pool areas were also fantastic. We held a cocktail party in Villa Gembira and it was the perfect setting. All staff were friendly and helpful and couldn’t do enough for us, from shopping for supplies, putting up giant birthday banners, cooking delicious breakfasts and giving us a beautiful surprise birthday cake. 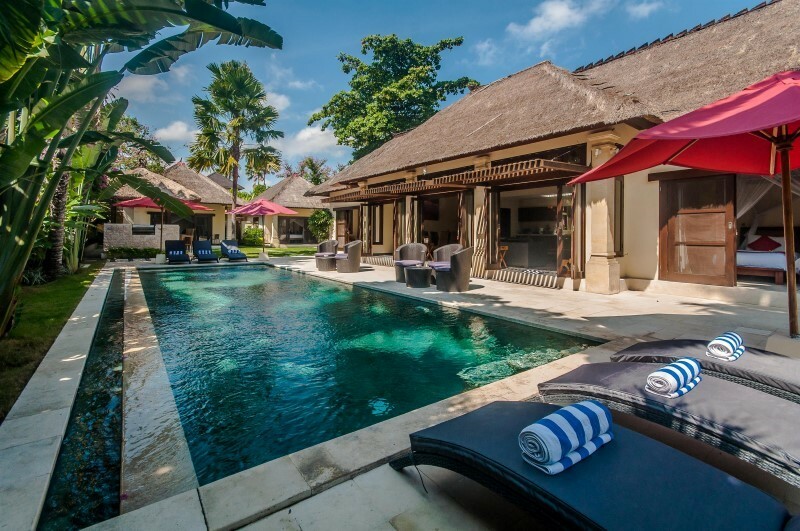 I would happily return to these villas for our next visit to Bali. 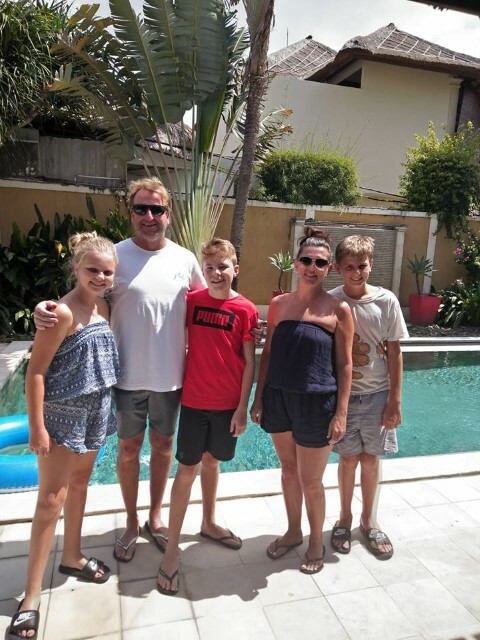 We stayed in Villa Gembira for 2 weeks in Oct 2014 and had an awesome holiday. 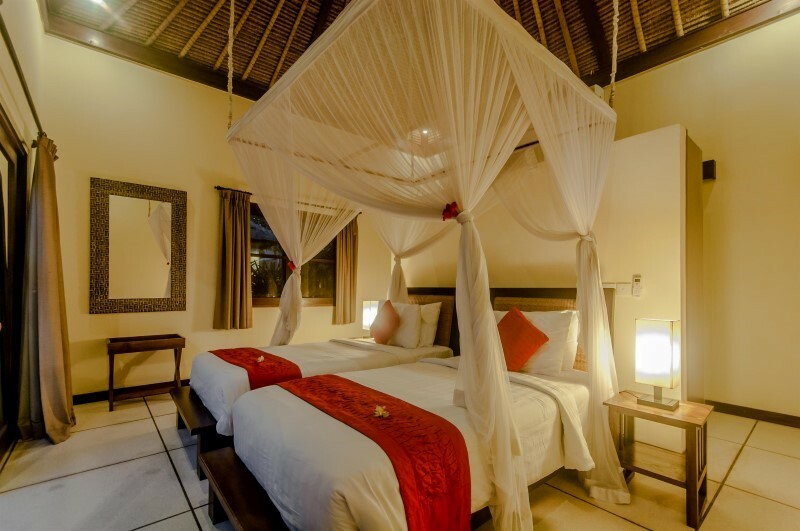 This is our first stay in Villa Gembira although we have stayed in Villa Saphir twice previously. 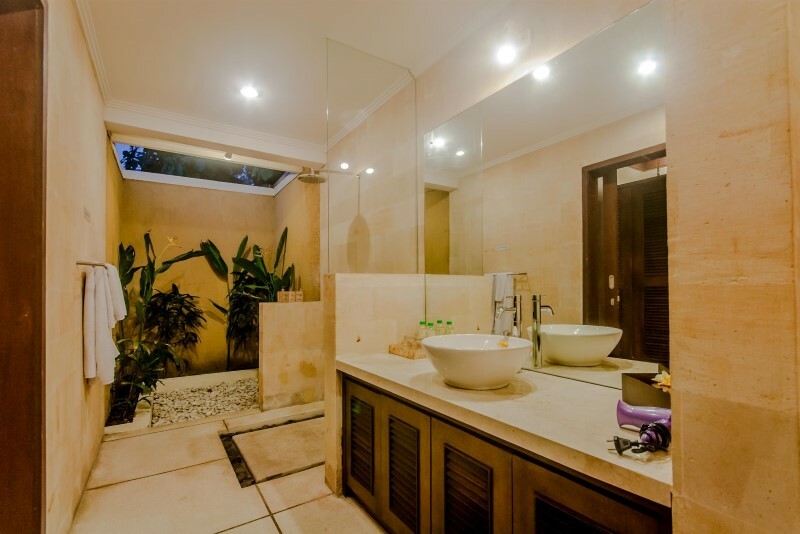 Gembira, like many of the Bugis Villas has a great open layout and comfortably accommodated our party of 4 adults and 5 children aged 10 – 14. The staff, as usual, were excellent especially Koman who cooked for us day in and day out for about 13 of our 15 days! We also got the staff to cook a massive BBQ banquet one evening which fed everyone including our friends next door (another family of 5). 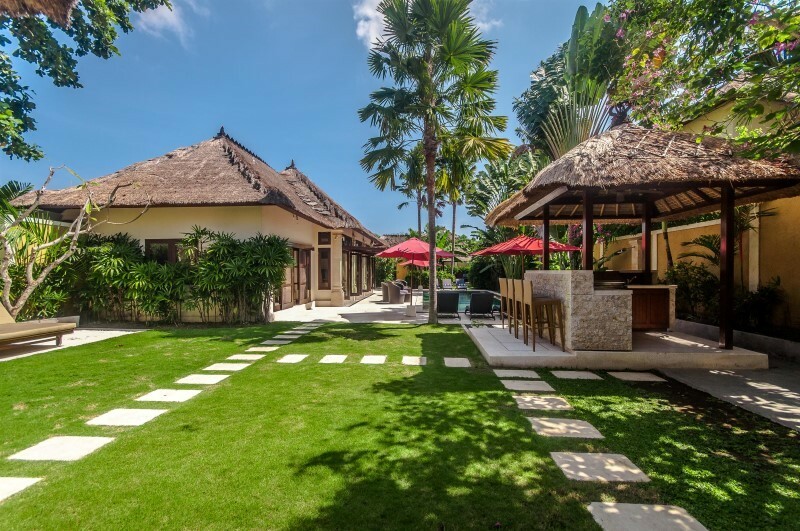 I would (and have) recommended Villa Bugis to anyone who is looking for a good value, chilled out Villa style holiday. Awesome work Villa Bugis, we will be back in April!! Great location – short walk from villa to a main street with shops, food, supermarket, money exchange etc. Very friendly staff who were available to help at any hour of the day. The Villa itself was beautiful! Very spacious and clean. The pool was great and the rooms were kept immaculate. 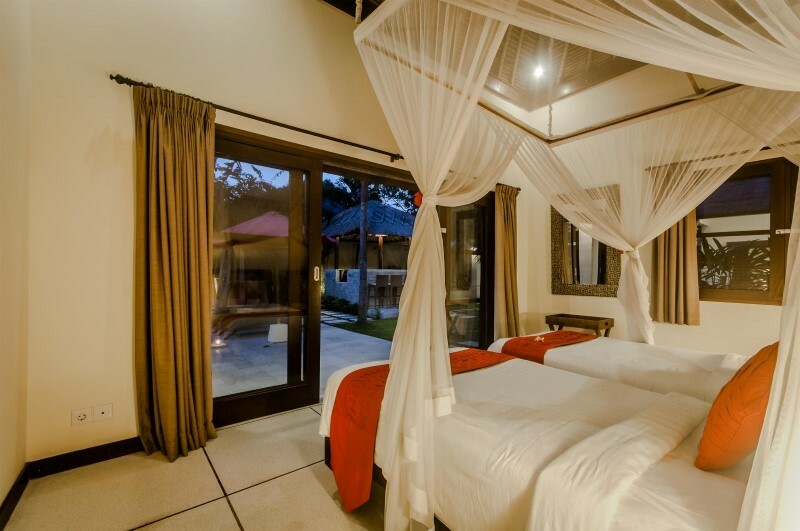 Villa gembira is a great little villa which can sleep 8 people. .it was bigger than we expected and the staff are very kind and are willing to help out all the time. The grounds are well maintained and look after. When we first arrived the villa is located down a very small windy street but we ended up hiring scooters to make the ride easier as taxi didn’t like to come down the road. Good position for accessibility to sights and surrounds. 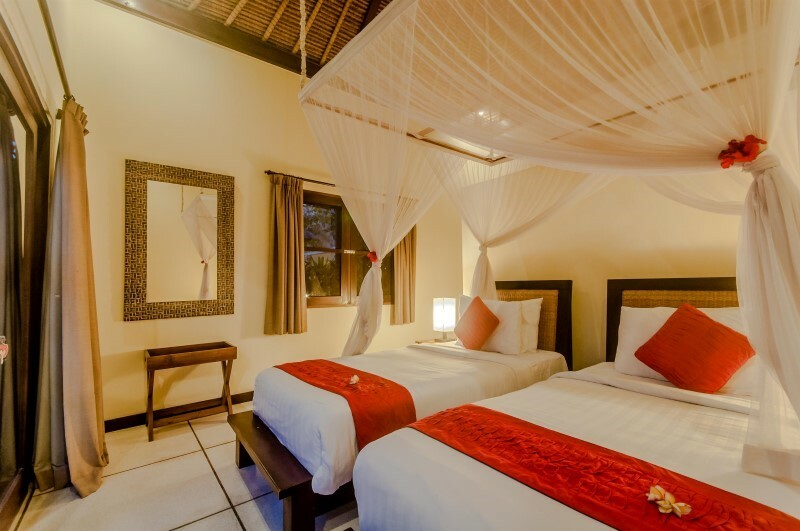 we have been very pleased with villa Gembira, staff have been excellent always very helpful,location map not very clear, A bit of a walk to main shopping areas & hard for transport,,we would suggest a golf buggy for villa Bugis guests to be transported to main street, mosquitos a bit of an issue in bedrooms. 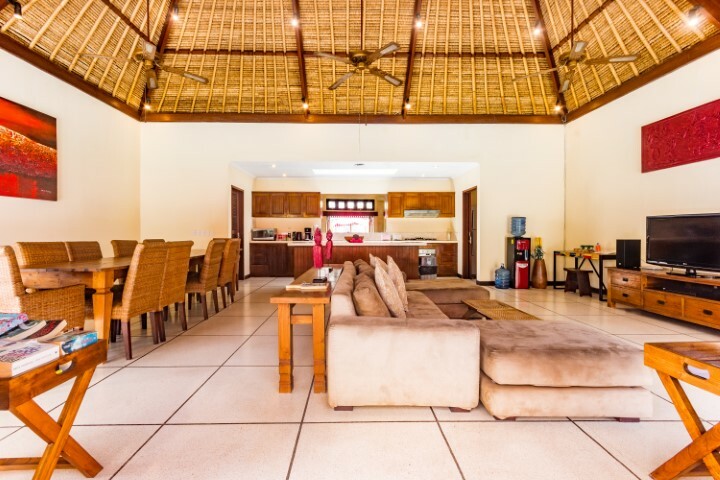 villa clean and very comfortable & excellent size, pool very clean. 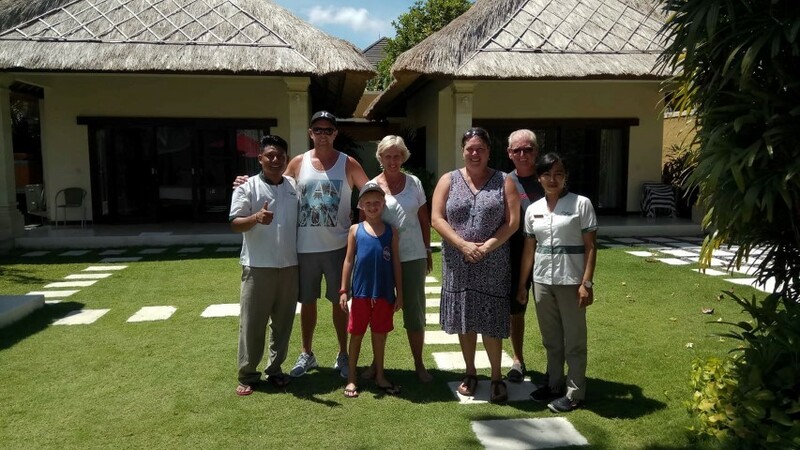 Thank you for making our stay very enjoyable, we will not hesitate to return to this villa.